SCT > Events > Cosa ha reso l’uomo in grado di dominare il mondo e cosa c’entra questo con il teatro? 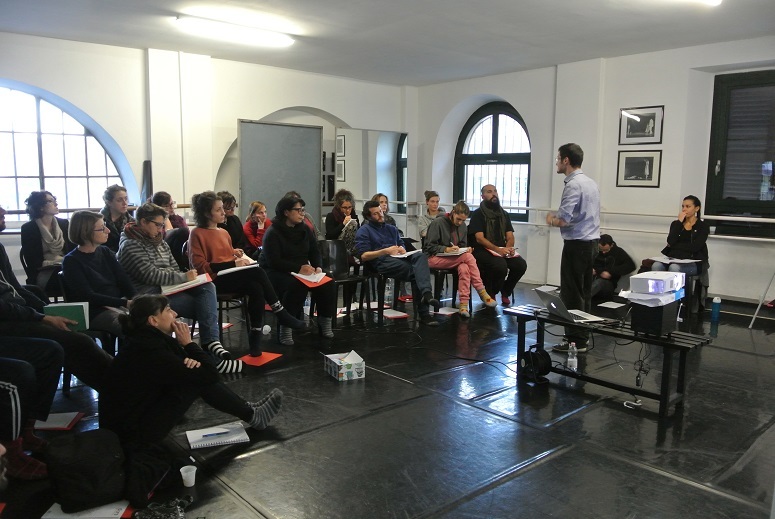 Alberto Pagliarino, head of the SCT Centre’s Culture & Communities Area, university researcher and actor, spoke at the first workshop of the SCT™ Advanced Training School. Here is part of his speech. 70,000 years ago, Homo sapiens developed a skill that would allow him to dominate the world. The ability to articulate a unique and complex language and to give life to immagination. As Yuval Noah Harari wrote, until then Homo sapiens was not very different from the Neanderthal, which stood out for its greater physical strength. Like every other animal on earth, the Sapiens lived a single level of existence: that of the real world. Thanks to this “cognitive revolution” the Sapiens began to live a double level of reality, to imagine stories and myths and to share these stories through language, giving rise to common and shared narratives. Homo sapiens, at some point in its evolution, was able to live a reality that is both real and imaginary. These allowed us to dominate the world: imagination and language. Hominids were able to form groups of about 50-70 individuals without problems, in some cases they could reach an average of 150 units, the so-called Dunbar number, from the name of its discoverer. After this threshold the community disintegrated and formed new separate groups with new leaders. The cognitive revolution has allowed us to break through the roof of 150 units thanks to the creation of myths that have given rise to shared principles and values. About 70,000 years ago, a group of human beings left Africa and proceeded to colonize the rest of the world, in a few tens of thousands of years spread in Asia, Europe up to Australia and, 16,000 years ago, to settle even on the American continent. While all other human species are extinct, the Sapiens have proliferated, have been able to organize themselves into communities of hundreds of individuals, to exchange complex information, to create sociality through “gossip”. The capacity for imagination has allowed man to create shared narratives that could generate common points of reference. Thus men were able to recognize themselves as part of the same group, even though they did not know each other directly. It is not essential to know each other directly to build a society, if we have a law or a God in which we believe and which requires us to follow a certain behaviour or to pursue common goals, such as the construction of a pyramid. And this has led to the establishment of increasingly larger groups, has allowed men to exceed the limit of one hundred and fifty individuals to reach groups of thousands, to create the first cities in Mesopotamia, and to build empires, nations, states. All this thanks to what some sociologists have called “social constructs”, imagined realities that as such in nature do not exist, but are result of the creation of groups of men connected by the same culture – culture in which they recognize, in which they believe. Every social construct exists just because it is shared. The imagination and the ability to represent what we imagine, therefore, are the prerequisites for the construction of societies. But imagination does not hold up without a glue. Without trust, we would not exist. A story exists and becomes real when a group of people trust that the story is true: this is why, for example, the Universal Declaration of Human Rights exists. The paper defines the principles in which we collectively believe and this collective trust makes these principles alive. Trust and imagination – which creates stories and strengthens the identity of a people – allow a group to recognize themselves as such and say: “I exist”. Societies are actually created with the bonds of trust between the individuals that make up the group; if there were no trust, the societies would disintegrate. Many anthropologists have questioned how man has been able to create and keep this glue of the society alive. Is there a paradigm that led to the creation of societies? Marcel Mauss, a French anthropologist of the 50s, gave us an answer: the paradigm with which man has created this sociality is the gift. Many communities base social ties on the exchange of gifts. Mauss compared various ethnographic researches carried out by other researchers in some tribes in the North of America, among the Maori of New Zealand and some inhabitants of the Trobriand Islands in the Pacific Ocean. He discovered that the exchange of goods was one of the most common and universal way to create human relationships. The gift grounds on the principle of reciprocity: it involves giving, receiving – accepting the object – and giving back. Who receives, has the moral and social obligation to give back, but ways and times are not strictly defined. The value of the gift lies in the absence of guarantees for the donor. An absence that presupposes a great trust in others. Anyone of us has experienced the bond introduced by a gift at the time of his birthday: a friend gives us a gift, and, when his birthday arrives, we feel obliged to give it back, and then we make “a counter gift”. The gift is very different from the barter, an exchange of goods of the same value, because the gift can be returned in time and does not provide that is returned exactly what has been given. The gifts are free and forced exchanges: they are “forced” because those who receive feel in debt and need to return the gift. The gift can connect a very large community by creating bonds between its members. It can create very strong bonds between families. Whoever does not return the gift is as if he did not accept the social bond with the donor and placed himself at the margin of society. The dynamic of the gift is supported by an imaginary and a shared narrative. Whether society is really born from the gift paradigm or not, what counts for us is that the dynamic of the gift is a real one, which creates sociality and can still be found in our society, even if on a small scale. Think about time bank or volunteering: they are examples of how man acts through an exchange of gifts and skills. But the dynamic of the gift is neither good nor bad and is used in order to strengthen links in criminal contexts, too. Think about the exchange of gifts – and favours – in the mafia context, for example. At the same time, the dynamic of the gift can exist even within a society where another type of social paradigm dominates. Our Western society, for example, is based on the paradigm of methodological individualism and on the contract. A society based exclusively on the gift creates strong bonds between people and is a binding society, in which individual freedom comes after the collective will. Adam Smith 300 years ago revolutionized the social model based on the bond. He argued that it would not last, that man needed to free himself from binding ties. How? Living in a contract-based society: benefits are regulated by a contract between the parties. The contract leads the relationship dynamics and has a deadline. The contract does not necessarily create social bonds between the supplier and the customer, between those who sell and those who buy. The contract makes the farmer free. The bonds become more fragile, less binding and risky. Our macro-level western society lies on this idea in different variations, up to the strongest positions that led to say: “there is no such thing as a society, there are only individuals and families”. If, in our society, the dynamics of the contract has won, within small groups the logic of the gift can still go on and can express strong potential. Everyone is part of a network: the more relationships we have and the more networks we have, the more we are able to act in a logic of gift and counter-donation, the more our chances of achieving our goals increase. Mauss’s theory has been taken up in the last decades by several social economists, who call this potential “share capital”, recognizing it has an economic value: the binding value (Alain Caillé). The share capital is the sum of all the relationships that belong to each individual and which help him in achieving his objectives. Networks of relationships, therefore, have an economic value, because the more contacts you have, the more you can reach your goals; this is why economists talk about share capital. […]. The American sociologist Mark Granovetter analysed the types of links within the networks of relationships of individuals, and distinguished them in strong ties (family ties, friends) and weak ties (acquaintances). Weak links are those links that allow the network to expand and connect different networks to each other. The strong bonds, in fact, from a functional point of view are not essential to make a network work, because they tend to create triangles. If you think about it, it is very likely that my two best friends know each other. If I suddenly disappear, my two friends will stay in touch and the network will continue to work. If a strong link ceases, it is very likely that the other strong ties will remain standing and that the network will continue to exist, but if a weak link is removed, part of the network is permanently cut off. Imaginary, trust, shared narratives and binding ties: these are the ingredients for building a community. Social and Community Theater™ (SCT) does it. It works on the creation of shared narratives, it builds networks and strengthens the dynamics of trust. It creates bonds through theatrical rituals, builds with people the narratives that belong to their community and in which they can be recognized, it “gives a name” to that particular community and creates performances that allow it to open to the outside world and to affirm: “I exist”. SCT™ helps to build virtuous bonds, but it does not start from nothing: it starts from the relationships and narratives that a specific community has already created, in order to strengthen and expand the bonds between individuals. It brings out the resources of the community, both in terms of share capital and in terms of community skills, it pulls them out like nuggets from a mine. Think about groups that already make art and have space, time, skills, etc. To work with the communities, if you do not know the territory, you need to find the reference points, to talk to those who have many weak ties on the territory and make them protagonists of the work process. These people are the community referents: people who have an active role in that neighbourhood, who know the history and stories of the territory and who therefore enjoy the respect and trust of at least a part of the network. For example, the parish priest, the contact person of an association that works with families in the neighbourhood etc. First of all, the actors who undertake a SCT™ project must find these contacts, share the project with them and deserve their trust. This allows not only to enlarge the portion of the community with which it is possible to collaborate, but also to understand what the SCT™ work could focus on, which are the most significant issues for this community. 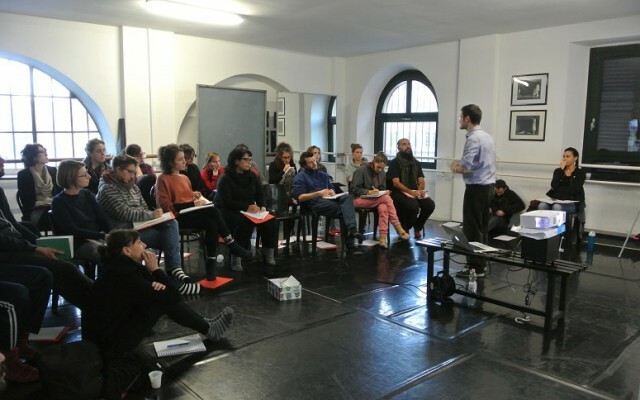 In this way, Social and Community Theatre™ is ready to offer the community a project that leads to a truly shared goal and to include the citizens in a path of rediscovery of what they can do and who they are.